Good morning. I’m John Podesta, President and CEO of the Center for American Progress. I’m glad to be here. Thank you to Tim Barber and Canada 2020 for having me here, thanks to the Canadian American Business Council and the U.S. Energy Association, and thanks also go to Ambassador Giffin for that very generous introduction. I’d also like to express my gratitude to Dr. David Lynch for the diagram he showed earlier this morning on oil sands research happening at the University of Alberta—it’s good to see something more complex and confusing than the just-passed health care bill. If the “greening” in the title of this morning’s program was conjured up to evoke a garden party in the oil sands, I’ll try not to play the part of the skunk. And I’ll also make a promise to Ambassador Doer here at the outset not to be “holier than thou.” While the presentations this morning made clear that the combination of policy and technology can reduce the negative environmental consequences of exploiting this resource, I’m skeptical about a “green” vision for tar sands, and I want to level with you about how I see the future of energy policy playing out. Of course, energy, as a policy issue, is massively complex. I’ll begin with a quote from one of America’s most well-known environmentalists—John Muir, who founded the Sierra Club almost 120 years ago. He said, simply but quite rightly: When we try to pick out anything by itself, we find it hitched up to everything else in the universe. When we look at energy—and when we look at oil, whether it be produced from deepwater wells in the Gulf of Mexico, tar sands, or conventional reserves—that observation couldn’t ring more true. From economics to geopolitics, from climate change to national security, the way we produce and use energy has enormous influence over all aspects of our lives. For some, like those who work on oil rigs—or for those who own them—this influence is manifested directly through the way they earn their livelihoods. But for most of us, it is less direct, although no less fundamental to our families’ well-beings or our collective future. At this moment, the United States, Canada, and the rest of the world all face an energy challenge unprecedented in its urgency, its stakes, its scope, and its opportunity. In 2010, atmospheric carbon dioxide levels will reach their highest concentration in at least a million years. This is because for the past 200 of them, human beings have relied almost exclusively on high-carbon fossil fuels like coal and oil to power economic growth, raise living standards, and increase mobility. But now, a decade into the 21st century, maintaining the status quo is no longer a possibility: How we choose to produce and consume energy today will change the world for either good or for ill for coming generations. This is a truth I think is important to emphasize. We are at a turning point in our history—we transition to cleaner sources of energy, and our children and grandchildren reap all the benefits that accompany that transition; or we continue to rely on 19th century forms of energy, even if it’s produced with 21st century technology, and create a world with an unpredictably altered climate, dwindling or difficult-to-reach energy resources, and exacerbated geopolitical instability. As I’ve said, up until now the strength of our economies and the well-being of our citizens have been built upon burning fossil fuels. But as remarkable and important as that progress has been, the use of these fuels to drive it has incurred great costs. Then and now, those costs include environmental degradation, negative public health effects, and, for oil-importing countries, national security risks. The Deepwater Horizon disaster has incurred all of these costs on Americans—it has devastated the gulf and its coastlines’ delicate ecosystems, shattered the region’s economy, sickened workers that have been exposed to chemicals, and demanded enormous amounts of our government’s attention and resources, which are not, after all, in infinite supply. It is one in a long line of wake-up calls, and we ignore it at our peril. Today, there is almost unanimous agreement that we can add another cost to dependence on high-carbon fuels. And this one is beyond our ability to calculate. Over the past decade, the world’s leading scientists have proven beyond a doubt that burning fossil fuels are causing changes in the earth’s climate that will be catastrophic if urgent action is not undertaken. The world’s CO2 emissions trajectory—even during global recession—tracks the worst of seven scenarios set out in 2001 by the U.N.’s Intergovernmental Panel on Climate Change. Continuing on this trajectory will raise global temperatures between 4 and 12 degrees Fahrenheit by the end of the century. Failing to curb our dependence on fossil fuels will create a world dramatically different than the one we’re currently accustomed to; one in which sea level rise, extreme weather, and reduced resource supplies will not only cause irreparable harm to ecosystems around the globe, but also tremendous human suffering and conflict. We need to do our best to absorb the weight of that fact and incorporate it into our decisions. Avoiding these dire outcomes should be reason enough to begin transforming the way energy is produced and consumed, both in the United States and around the world. When I started the Center in 2003, driving this change became one of our founding missions. At the time, conventional wisdom suggested we’d picked a fight impossible to win. We believed then, and we believe now, that it can be won, and that it must. And we continue to work tirelessly to help enact the policy changes we think are crucial to creating a clean energy future. But finding the right answers, and striking the right balances, as we transition—especially once you get down into the weeds of the issues—is not easy. When everything is hitched up to everything else in the universe, identifying priorities, making trade-offs, understanding both short- and long-term implications, diagnosing risk—all of these things are tremendously complicated. Add in a healthy dose of politics leavened with moneyed interests, and the task is even more daunting. Energy in particular is laden with these interconnected issues. The role of nuclear power and natural gas are two that are easy to point to; the exploitation of tar sands, as we tend to call them, or oil sands, as you do, is also one. My own perspective on tar sands exploitation takes what I believe is the broader public interest—over the long term, not the short one—as a primary lens. Now is a good time to have this discussion. Today, tar sands oil accounts for 4 percent of America’s overall oil use, but will become our top source of imported oil this year, ahead of conventional Canadian imports and those from Saudi Arabia and Kuwait combined. Expert projections find that U.S. imports from tar sands could rise to as much as 36 percent over just the next two decades. As we look down this road, there are a few things it’s tough not to agree on at the outset. 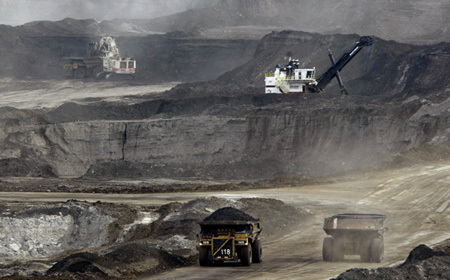 Oil extraction from tar sands is polluting, destructive, expensive, and energy intensive. These things are facts. I think suggesting this process can come close to approximating being “greened” is largely misleading, or far too optimistic, or perhaps both. It stands alongside clean coal and error-free deepwater drilling as more PR than reality. Surface mining decimates an entire landscape, clearing away trees and animals along with the top layer earth. This process literally kills the landscape to recover the oil underneath. Toxic tailing lakes in Alberta now cover an area equivalent in size to Vancouver, or Washington, D.C., if you prefer, and pose a terrible threat to wildlife and, quite possibly, the health of people who live in their vicinity. Reclamation, even under Alberta’s relatively strict standards, remains a distant goal for most of the area disturbed. Surface mining is also extremely water intensive, and the Alberta government has granted permits allowing oil companies to divert enough water to sustain six cities of a million people for an entire year. Compared to the scorched-earth effects of surface mining, in situ mining is less destructive to the local environment. But that really isn’t saying that much. This technique has its own environmental consequences, including severe fragmentation of fragile habitats, loss of wetlands, decreases in wildlife, and groundwater contamination. And on top of these effects on the direct environment, in situ’s carbon footprint is nearly three times heavier than surface mining’s, which is a big and growing problem in an increasingly carbon constrained world. That results from the use of natural gas in the extraction process. The CO2 premium, if you will, I believe is a bit higher than James Rajotte suggests—perhaps 15 percent to 20 percent relevant to conventional oil. Let me make a note on what the CO2 goal here seems to be, in light of this morning’s discussions. If developed countries need to reduce CO2 emissions by 80 percent by 2050, setting a goal of lowering oil sands emissions to come into line with conventional oil production is the wrong goal. The arrow is pointing in the wrong direction. Oil sands can’t simply be as good as conventional oil. We need to reduce fossil fuel use and accelerate the transition to cleaner technologies, in the transportation sector and elsewhere. Canada should make every effort to evaluate and understand the full cost of exploiting these unconventional sources. But Canadians don’t need a lecture from an American about protecting their environment. Some of my progressive counterparts would probably disagree on this point, but thinking about this from the effects on the Alberta environment alone, Canada’s people are empowered through their democracy to decide how to balance environmental priorities against industrial activities. And I respect the fact that the Alberta government has taken steps to try to reduce the environmental degradation that comes from extracting oil in these ways, including $15 per ton carbon levy. But the global effects of climate change now complicate our ideas about environmental responsibility. The boreal forests represent over a tenth of the world’s terrestrial carbon storehouses. And in the next 10 years alone, tar sands operations are forecast to triple their contribution to Canada’s total CO2 emissions. These atmospheric impacts are no longer a localized affair now that we know CO2 emissions are causing environmental changes around the world—especially in regions that already suffer from extreme poverty and deprivation. To be fair, tar sands exploitation has distinct strategic advantages, especially in the near term, for both the United States and Canada. These are mostly economic and security related, and they aren’t trivial. The U.S. needs energy from stable sources, and Canada provides that. Reasonable people can disagree when priorities are weighed differently among those with different perspectives or time horizons. But what I think reasonable people cannot easily disagree on is the choice I laid out at the front of this talk—we either rapidly green the world’s engine of economic growth, or we suffer consequences that are very difficult to even fully comprehend, in addition to those we already tolerate. Unconventional sources of fossil fuels cannot be our energy future. There are no leapfrogging technologies on the horizon that suggest with any plausibility that this could be otherwise. There are no silver bullets waiting to be fired. Notwithstanding the substantial investments our governments are making in RD&D on carbon capture and sequestration, at this point, it is still closer to being on the drawing board than being deployed. For the reasons Dr. Lynch mentioned, investments should not be made on the assumption that CCS is a technology that will make continued production of fossil fuels environmentally and economically viable. Of course, our countries should continue to cooperate on CCS research, as Secretary Chu and Minister Prentice are directing. But for the foreseeable future, “greening” inherently dirty sources of energy does not add up to much more than tinkering at the margins. Yet industry is plowing capital into unconventional sources of oil, while making only superficial investments in clean technologies that would serve the public good. Research by the Center for American Progress found that the big five oil companies invested only 1.7 percent of profits in clean energy R&D. As two leading academics noted in an article in The Washington Post recently, this is because the corporate culture and core competence of oil companies favor large, centralized investment opportunities, like the unconventional resources in Canada or deepwater drilling in the Gulf of Mexico. Beyond Petroleum is an ironic slogan, but not a real strategy. But of course, oil companies are structured to make money this way, and that, like all industries, is their purpose. The winner of an OPEC Award from the International Association from Energy Economics estimates that the oil industry of 2100 will be both larger than today’s and up to 90 percent dependent on unconventional oil. That future is flatly incompatible with one in which we achieve a best-case climate scenario. So where does all this leave us in the largest sense? To borrow a metaphor from Canada’s former environment minister, right now the United States, Canada, and the rest of the world are absurdly trying to ride two horses galloping in opposite directions. We all recognize we have to keep global temperatures under 2 degrees Celsius to avoid catastrophic climate change. Importing countries, the United States in particular, also recognize that their addiction to oil sustains and enriches bad actors around the globe, regardless from whom their own particular imports are purchased. But our reliance on oil continues unchecked. Soon, though, policies in the United States and elsewhere will almost certainly catch up with the demands of climate science, and technologies will come on-line that will ease the transition to a low-carbon future. At CAP, it is our hope that 2010 will be remembered as the year that the United States began to turn away from oil, no matter what its source. This turning point has many elements: significantly higher fuel economy standards for all classes of vehicles; transitioning our heavy transportation fleets to natural gas; accelerating research and development of the electrification of cars and light trucks; big investments in mass transit; sensible residential development that discourages sprawl and long commutes; and a shrinking cap on carbon from transportation fuels. The Obama administration has already taken aggressive executive actions in support of clean energy. A few months before the House of Representatives passed its comprehensive climate and energy bill, the U.S. Environmental Protection Agency found that the administration has the legal right to limit CO2 and other greenhouse gas emissions through a regulatory program under the Clean Air Act. The EPA’s decision sent a strong message to opponents of climate legislation in Senate: The alternative to passing strong legislation is not the status quo, but rather an EPA regime to regulate CO2 emissions. If the U.S. Senate fails to act on climate change legislation this summer, perhaps with a carbon-based linked fee on the transportation sector, the EPA will be tasked with doing the job. The Obama administration has been especially active in the area of fuel economy and emissions standards for vehicles. A year ago, the president announced the largest increase in fuel economy standards for cars and light trucks in 30 years, along with the first-ever federal global warming tailpipe pollution standards. Earlier this spring, these standards were finalized, and according to a Union of Concerned Scientists’ analysis, their implementation will save the United States 1.2 million barrels of oil a day by 2020. President Obama also announced his intent to set the first-ever fuel economy and global warming tailpipe pollution standards for medium- and heavy-duty trucks, which will save consumers at least $24 billion through reduced fuel costs in 2030. As the ambassador noted, Canada and the United States are working together to align their standards in this area to create a fully integrated market. And just a few weeks ago, the president set the agencies in motion to develop the next round of fuel economy and tailpipe emissions standards for vehicle models beginning in 2017. After years of inaction and neglect, federal standards have now quickly risen to be on par with the state of California’s. Another California-born energy policy that the federal government is likely to follow is setting a low-carbon fuel standard. California’s three-year old program sets a model both for the nation and for other states; 20 states are now in various stages of setting their own low-carbon fuel standards. They will likely be an increasingly important part of the energy policy landscape, both at the state and the federal level. The industry should plan for these policy inevitabilities seriously and seek opportunities within them, rather than fight policymakers every step of the way. And that future doesn’t mean that oil-based fuels won’t have a role. We’re not in a zero-sum game, even if we’d like to be. But it is my view that the role of unconventional oil will have to be altered in order to be economically and environmentally viable. One plausible option is blending higher lifecycle carbon content oil with cellulosic or other next generation biofuels to lower its lifecycle carbon content. This would allow oil produced in Canada to meet a federal low-carbon fuel standard. Tar sands companies have a strong incentive to support this industry and throw considerable resources behind it. It’s important that the United States also does its part to direct investment to the right places as we attempt to make the transition to clean energy. Policymakers should make careful, long-view decisions, and send the right signals at this point in time. That’s why I question the hurry with which the State Department has chosen to decide whether or not to approve the Keystone XL oil pipeline slated to reach from Alberta to the Gulf of Mexico. First, as the gulf spill reminds us every day, rushing to complete oil projects invites disaster. There are enough legitimate questions about this pipeline—how soon it will be needed, its design and safety, and its potential impacts on important ecosystems along its 2,000 mile length—to take a more deliberate approach. The State Department’s own Environmental Impact Statement noted that the locations of greatest concern for potential oil spills would be in environmentally sensitive areas, especially wetlands, flowing streams and rivers, and water intakes for drinking water or commercial and industrial users. The Keystone XL pipeline would pass over the deep end of the largest underground aquifer in the United States, which supplies water to 2 million people and is critical to the region’s agricultural economy. Even a small spill in this part of the country could have disastrous consequences on the economy, the environment, and public health. TransCanada’s pending request to use thinner pipeline for the Keystone XL project through areas it deems “low consequence” seems especially ill timed in the wake of the Deepwater Horizon disaster. Our risk tolerance should be extremely low, and our consideration should be complete. A hurried approval of the Keystone XL pipeline would also undercut the administration’s larger vision of finally, after decades of promises from our leaders, making the investments and the hard decisions to take advantage of clean, domestic energy sources that are waiting to be tapped. As progressives, environmentalists, and now even economists and national security experts agree, the benefits of transitioning away from fossil fuels towards clean, sustainable sources of energy go far beyond climate change mitigation. We have an opportunity to create millions of new jobs worldwide, deploy new sources of energy that are clean and domestically produced, and free ourselves from chasing resources that distort foreign policy priorities and drain investment away from challenges like global poverty and disease. The United States and Canada should cooperate to build this future together. The disaster in the gulf reminds us every day—as it will for some time to come—that we can and must do better. The oil industry is extracting oil from sources that are harder and riskier to access, and where a one-in-a-million failure, even if that is an accurate risk assessment, nevertheless has huge, unaffordable consequences. Instead of pursuing energy sources that will perpetuate this legacy, the United States and Canada should join in partnership to put in place clean energy policies that will help us harness sources of energy that will never run out and can’t risk catastrophe. As President Obama said in Ottawa last year, as two of the wealthiest countries, we can and must be leaders. Energy security is now intertwined with climate and economic security—all of which will be improved by reducing our dependence on oil and accelerating our transformation to clean energy. President Obama and Prime Minister Harper have already prioritized this by setting up a Clean Energy Dialogue last year, and two months ago Secretary Chu and Minister Prentice signed a Declaration of Intent that will deepen collaboration across a number of research areas. Our two countries should continue to aggressively work together to leverage our unique relationship and devise solutions to the full range of energy challenges our future demands. I’ll end by thanking you for having me here today and expressing the hope that individuals and groups with differences of opinion will communicate and cooperate to the fullest extent possible. Transitioning to cleaner sources of energy isn’t a zero-sum game. We should aggressively seek new opportunities as we attempt to strike the right balances between the environment, the climate, our security, and our economy. Thank you for inviting me to be a part of this conversation, and I’m happy to take your questions now. John D. Podesta is President and CEO of the Center for American Progress.